On the last weekend of January 2016 the weather was gorgeous. Bicyclists of every flavor were out and about, BMX’ers flowing at the skate park, commuters riding around town, spandex clad cyclists out on long training rides. Myself and a couple of friends took advantage of the warmer temps on Sunday to get out for a long gravel ride out on the country roads in Indiana. One bicyclist was riding in Anderson township, probably just finishing up a nice long ride. An SUV swerved into the shoulder and hit him. The driver of the SUV, Melinda Woodall, left him there, driving off with a smashed windshield. She was later apprehended and police found needles in the car and bottles of pills hidden in her bra. She was arrested and taken to jail. Drugs make people do very bad things. I don’t think the driver got up Sunday morning and said, “I am gonna kill a bicyclist today”. She is a drug addict. She was high. She nodded off behind the wheel and her car hit Michael Prater. She will now suffer the consequences for the rest of her life. I am not condoning her actions by any means. My heart is aching for the family and loved ones of Michael Prater. His wife and two kids no longer have a father. It’s a horrific tragedy for everyone involved. Mobo built a ghost bike yesterday. 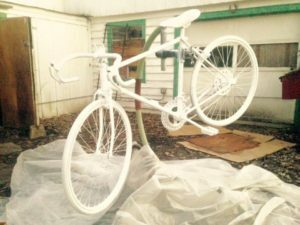 The community is coming together to host a memorial bike ride for Michael Prater. The Facebook event details are here. You can donate to the Prater family via this Go Fund Me page right here. If you have it in your heart to say a prayer for the girl sitting in jail right now, please do so. Ride safe out there ya’ll. Ya never know when it’ll be your last.